So while Islam teaches us that we are created in the best of molds, not in a flawed way, humans do have challenges in their personal lives, all of us have them, and each one of us has a different set of challenges, with friends and family, especially with family. But for a long time, in the way that I was exposed to Islamic literature and Islamic discussions, it seemed to me that there was a knowledge-based approach to the literature and to the sacred texts. That it was in some sense removed from our personal experience. So it is easy for a Muslim to start thinking that the Qur’an is dealing with the big things, not dealing with how he or she is feeling. They think that the Qur’an is probably not the place to go to figure out their emotional and personal issues, that the Qur’an can’t be that specific. That’s actually the idea I’d like to counter, and I will try to present here an alternative narrative – that the Qur’an, in fact, addresses pretty much every dilemma the human being goes through. We all go through various physical, moral, spiritual, and psychological crises and Allah (SWT) has revealed this Book to us and the given us the example of the beautiful sunnah of His messenger (SAW) to actually help us navigate these crises, because He is the One who created us with these emotions. Sadness is one of those emotions and a reality of life, and one is not any less of a person when experiencing sadness. Having good eman, having strong faith, does not mean you are guaranteed happiness. They are not equivalents, not in this world at least. This is a world of difficulty, of challenges, and of trial. So for instance, Ibrahim (AS) as a young man experienced the trial of being expelled from his own house. That’s traumatic, being kicked out of your home by your father and having to leave your village and entire family. And then there is the example of Yusuf (AS) who is betrayed by his older brothers. He was a small child and wanted to be like his older brothers, as there is always an attachment to older siblings. Allah put that affiliation within the human being, that the younger one wants to be like the older siblings. But Yusuf was betrayed by those who he looked up to. That’s traumatic. That’s really sad. We also learn that this child had such a close relationship with his father, that he even talked to him about what he dreamt. That’s not an easy thing for a child to feel comfortable enough to tell his father what happened in his dream. That’s a real closeness between father and son. And Yusuf’s father was very carefully listening, attentively listening to the dream described by his child. And then this child is taken from his father. There’s the sadness of the father and the sadness of the son. And it is one thing to know your son died. It’s another thing to not even know what happened. That’s traumatizing. Then we have the example of the Prophet (SAW) and the Quraish, or the Prophet and his uncle. What kind of uncle, not a distant but a close uncle, celebrates when his nephew just lost a baby. The baby just died in the household of Muhammad (SAW) and Abu Lahab goes out to celebrate that Muhammad will not have a son, that his name will not carry on. And they didn’t have roofs on the houses back then so when your neighbor is in his backyard and you are in your backyard, and he is loud, you can hear it. That’s got to hurt. Your own uncle celebrating the death of your child. Even enemies put their weapons down when they hear the general on the other side just lost a baby. He gives his enemy a chance to grieve because he feels that pain. This is honor among enemies even. And the reason that story is so important is that it’s teaching us that sometimes the most painful blows and the most traumatic sadness you will experience in our lives will be from family. It will not be some stranger who will cause you sadness. It will be people who are closest to you. Because they have such close access to your heart. The Prophet (SAW) himself experienced these things in the most horrendous way. And there’s a reason Allah (SWT) put these stories in the Qur’an for us, so that we won’t feel that we are the only ones dealing with these difficult challenges of life. Then there is Adam (AS) and his sadness. His sadness was whether Allah had forgiven him or not. He was in Jannah and just a moment later he was on the earth, wandering around trying to figure out what to do. Last thing he knew, Allah was not happy with him. He did something he shouldn’t have done. How did Adam know that Allah had forgiven him? He didn’t. But Allah (SWT) gave Adam a gift. The Qur’an says, “Then Adam received words from his Lord. And He turned towards him. Truly He is Oft-Pardoning, the Most Merciful.”(Qur’an 2:37). So Adam was brought into contact with words from his Lord and as a result of those words, Allah accepted his repentance. Adam used the words sincerely and then Allah forgave him. When someone asks how they can know if they are forgiven, the answer is that we are children of Adam, so we inherited the gift. Wisdom is passed on from generation to generation 100 percent, different from property or money which have to be divided. The prophetic situations of sadness and grief all turn into dua’s. Musa (AS), for example, punched a man who then died. Those kinds of mistakes can haunt you for life. Even though it was an honest mistake, he had guilt for taking another’s life. But Allah inspired him with a beautiful du’a: “O my Sustainer! Verily, I am in dire need any good which You may bestow upon me!” (Qur’an 28:24). That is actually the key to moving on with life. If you made a mistake and don’t know how to move on, learn from the du’a of Musa (AS). And the word “good” in the du’a means two things: positive experiences and good opportunities in life (so that the mistake made in the past does not bring additional sadness after sadness). The other meaning of “good” that’s more relevant here is that if you have made a mistake in your past, then the only way to move on is to become desperate to do good deeds. Musa, in effect, was praying that if his Master would give him opportunity to do good, he would jump on the chance. Like someone bankrupt who jumps toward a coin, Musa was feeling bankrupt and would jump toward a good deed — helping someone, doing something good. And it doesn’t mean make more salah or make more du’a. That’s standard anyway. You have to do that anyway. The way is to help people. Do good things for people. Mend relations, visit the sick, take care of your parents, visit your grandparents, talk to the cousin who you dislike, send them a gift. Musa saw that helping the young women was his healing, his way to move on with his life. In fact, Musa’s nation caused him so much pain. And the only one willing to listen to him, to what he has to say, is his own brother. So he turns to Allah and says “I have no control over anybody, only myself and my brother.” For most people trauma is caused by circumstance — sickness, death of a loved one — things you can’t control. Often people have a great deal of sadness that turns into rage and that rage is then directed toward Allah. The people of weak faith turn their rage towards Allah, saying “Why did Allah let this happen to me?” “Why is Allah doing this to me?” “I deserve better.” “How can He call Himself merciful and loving and caring and do this to me?” This is a very common phenomenon nowadays, that people suffer and then they blame Allah. They have bad experiences and then blame Allah. But the only people who can do that are those who don’t know who Allah is. They have a long-distance relationship with Allah and have a lot of assumptions about Him. I’ve come to learn that about relationships in general, not just about the relationship with Allah. When you have a friend that you talk to everyday you’re on the same page. When you haven’t talked to them in three, four, or five months, then you start making assumptions about how they think. Or what they think of you. Then even when they call you, you can easily misinterpret what they say. Why? Because you’re not in constant contact. When we are not in constant communication with Allah, we start developing really strange opinions about Allah, what He means to us and how much He cares about us. In hadith Qudsi, we are told “I am as My slave assumes Me to be.” So if a person assumes that Allah doesn’t care, then He will fulfill it. If he assumes that Allah loves him, then He will fulfill that. If he assumes that Allah (SAW) will provide, then He will provide. One of Allah’s most beautiful names is Ar-Rahman, which comes from the Arabic word “rahma.” This is usually translated as “mercy.” This translation is, however, problematic on many fronts. One of the problems is that mercy is used when you are spared like when a soldier shows the enemy mercy, meaning he didn’t kill him. Mercy is used in contexts where something bad is about to happen, and then it stops from happening. But when we think of Allah as merciful, we can’t consider that connotation, we can’t think “Oh bad things were about to happen and Allah decided not to punish us.” The word “rahma” comes from “rahm” which means the belly of the mother when she is pregnant, the womb of the mother. The way we can understand what rahma is when we reflect upon what the womb of the mother is. And then we might begin to understand what Ar-Rahman is. The womb of the mother was the place we all were in at the beginning of our earthly existence, where we didn’t have to worry about food, shelter, clothing — all of needs were taken care of. If there was a problem, who dealt with the problem, the mother did. The womb was our world and we were wrapped in care and in love. All she has for the child is love. Actually one of the core meanings of rahma is someone who wraps you in his care because of love. And no one does that more than Allah. He surrounds you in His care because of His love. That’s Ar-Rahman. And we should note that we cannot compare creation to Allah. What your mother did for you in her belly cannot even be compared to what Allah is doing for you all the time. So Ar-Rahman – that’s the first remedy in the Qur’an, remembering and reflecting on the Names of Allah, and of them Ar-Rahman, the One we invoke all the time, is a special remedy for sadness. The second remedy we can find in the story of Musa (AS) when he helped his people escape Egypt. Musa helped his people, with the permission of Allah, to escape. These people had been in slavery for quite some time, and it was a time of sadness. What adds to that sadness is that the people who were walking across the body of water had vivid memory of babies being slaughtered in front of their eyes, their own children not just dying, but being murdered. Is that a memory that just disappears? Even though they have escaped the clutches of Pharaoh, these people had lived a life of indescribable sadness. The loss of thousands of children in front of the eyes of the parents at the hands of merciless soldiers. That was a policy of Egypt. These were grieving parents who were escaping Egypt. And Musa (AS) has helped them escape. Now they are on the other side of the sea. Has their sadness disappeared? No. Now Musa (AS) delivered to them a khutbah. You would think that in this khutbah he was going to tell them to be patient because when someone is sad, what do we usually tell them? Be patient. But nobody ever tells you how. Patience is a goal, but they don’t tell you the “how” to patience. It is not an instantaneous state that you can just will yourself to be in. You have to do certain other things that get you to patience. Patience is an acquired power. It is not something innate in us. It has to be nurtured. So in this khutbah, Allah is giving us the key to how to nurture patience. As a matter of fact, they are out in the middle of the desert and don’t even have food supplies, and there is the sadness and trauma of that terrible history they have left, yet Allah through the mouth of Musa, tells them that if they could just be grateful a little bit, He will absolutely give them more and more and more. He is telling the people who lived nothing but misery, and Musa is telling them, to be grateful. This is the key, and it’s one of the remedies to sadness — changing one’s thoughts. The messenger, Musa (AS), changed the mindset of the entire people, telling them not to think about the sad things that happened in their lives, but to focus on the good things that happened in their lives. And when you do that, who will you give credit to? Allah (SWT). And when you become grateful, what becomes easy? Patience becomes easy. When gratitude is not there, patience is impossible. Why are sabr (patience) and shukr (gratitude) two wings of a bird? A bird can’t fly with one wing. Without gratitude and the patience it yields, these people could not move on with their lives. In this khutbah, Allah is saying that if the people show just a bit of gratitude, He will “increase them.” The question is, increase them in what? In this verse, He doesn’t say in what. This is because each one needs something different and whatever is needed, He will increase it. Some He will increase in children, some in patience, some in strength, in knowledge, in wisdom, in material provisions, in happiness — in whatever each one needs to have increased. The final remedy is on the same note. One of the most traumatic experiences emotionally of the Prophet’s life was the loss of his beloved son. Losing a child is something that is hard to stop thinking about. Then Allah (SWT), in Surah Al-Kauthar, says, “Behold, We have bestowed upon you good in abundance” (Qur’an, 108:1). The Prophet (SAW) was in the hardest of times, and Allah is telling him that He has given him the ultimate in abundance. You can’t want more than that — al-kauthar, which is the Qur’an, which, itself, is the remedy for sadness. So when Allah is speaking to us through the Qur’an, that is the remedy for sadness. And when one becomes grateful, what’s the show of gratitude? The show of gratitude is salah. And what’s the show of celebration? Slaughtering an animal. The surah continues, “Hence, pray unto thy Sustainer [alone], and sacrifice [unto Him alone]” (Qur’an, 108:2). And as for the Prophet’s enemy, The Qur’an says, “For he who hates you, he will be cut off [from future hope]” (Qur’an, 108:3). Allah is telling the Prophet not to worry about his enemy, that Allah will take care of him. Just focus on praying and the good that He has given. Just think about that and the sadness will go away. Muslims will have to learn these remedies from the Qur’an, through a relationship with the Qur’an, by personally having an emotional attachment to the Word of Allah. When that happens to you, you will not be overwhelmed by sadness. Sadness will come, and Allah will take it away. And again and again. So the Qur’an, itself, is a remedy. Today, people play video games to get rid of their sadness. They do drugs, smoke weed, take hallucinogens, they drink, they go to clubs so they can listen to brain-numbing music all night so they don’t have to actually think about how miserable their lives are. Even if they are going to vomit the entire next day, it doesn’t matter. At least for a time they don’t have to deal with their sadness. But Allah has given us the solution for all the forms of sadness, in His Book. In fact, the world could use the optimism the Qur’an has to offer. But the world will not see it until we exhibit it. Why would anyone be curious about the Qur’an if the people of Qur’an are always frowning? When I lived for a long time in New York, I didn’t know there was such a thing as Muslims just normally smiling. That was a new experience for me when I left here. People here have plenty of reason to be miserable – the smog, the pushing around on the subway, everybody else trying to cut you off, the parking problem, and so on. All the reason to be upset. But Muslims are supposed to exhibit happiness, a joy in their lives just because they are Muslim. And other people around us should wonder why Muslims are happy. Wouldn’t they want to know that Muslims are happy because we have the Qur’an. It takes care of all our problems. That’s what you’re supposed to exhibit. We have so many reasons to be happy, to be grateful to Allah. We are living, I believe, at a time that is on the verge of a major Islamic renaissance in the world and we have the opportunity to be in the driver’s seat. Muslim youth in North America especially can take the driver’s seat. A world-wide Islamic renaissance, a cultural one, an intellectual one, a moral one, that is on the horizon. We have been at the lowest point. We can’t go lower, so the only way to go now is up. 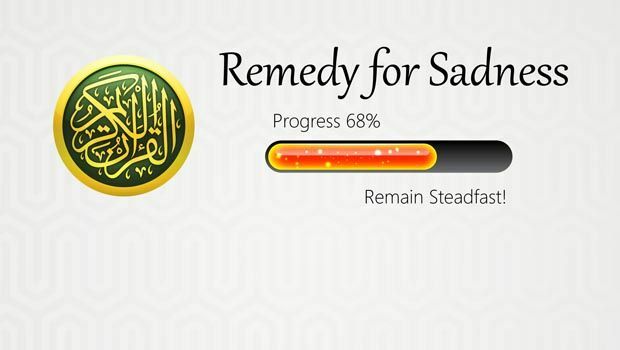 Let us all be healed by the remedies for sadness that Allah (SWT) offers in His Book. May Allah make our prayers and recitation of the Qur’an and our learning and our brotherhood and our sincere counsel to one another means by which broken hearts are healed. May Allah make us as an example for everyone else in the world, that Islam makes life beautiful. And this is what makes Muslims beautiful. Waqas Nouman Ali Khan is the founder and director of the Bayyinah Institute.